Some people make it through hard work and talent. Some fall by the wayside. And some people are just plain lucky. They are blessed with Bloody Good Luck! But is it possible to attract good luck? Can we train ourselves to be lucky? Apparently it seems that Dame Luck isn't that fickle. She is well within our reach. In his first non-fiction foray, bestselling author Ashwin Sanghi explores that critical, much-longed-for element called luck. Through entertaining and informative anecdotes, narrations of personal experiences and vignettes of homespun wisdom, Ashwin gives us a whole new insight into how people can work towards being lucky. It seems that luck isn't entirely the twist of fate that it is made out to be! 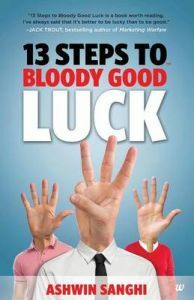 Ashwin Sanghi is counted among India's highest-selling English fiction authors.13 Steps to Bloody Good Luck is his foray into the world of non-fiction. Till date Ashwin has written three independent novels, all bestsellers, including The Rozabal Line, Chanakya's Chant and The Krishna Key. In addition he has co-authored a crime thriller, Private India, along with James Patterson, the world's highest-selling writer.Ashwin's books have sold in lakhs and have been translated into many languages. Ashwin was included by Forbes India in their Celebrity India 100 Rankings and was recipient of the Crossword Popular Choice Award.Ashwin was educated at the Cathedral & John Connon School, Mumbai, and St. Xavier's College, Mumbai. He also holds a Masters degree in business from Yale. Ashwin lives in Mumbai with his wife Anushika and his son Raghuvir.